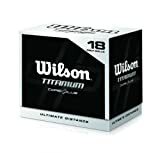 Wilson Titanium Balls – 18 packBoost your distance on every shot with this 18-pack of Wilson Titanium golf balls. Each two-piece Titanium ball features a titanium core that allows for maximum energy transfer on impact, helping the ball travel far and straight every time. The balls also include sturdy Surlyn covers.